File Name: Farley S. Seward of Galena, Alaska. Notes: Galena in central Alaska really is in the middle of nowhere, 270 miles west of Fairbanks on the Yukon River, just south of the Koyukuk National Wildlife Refuge. It is inaccessible by road and can only by reached by river during the summer. Sunbow's Frostbite wore his 1985 outfit with gold-tinted goggles and darker fur on his cap and collar. 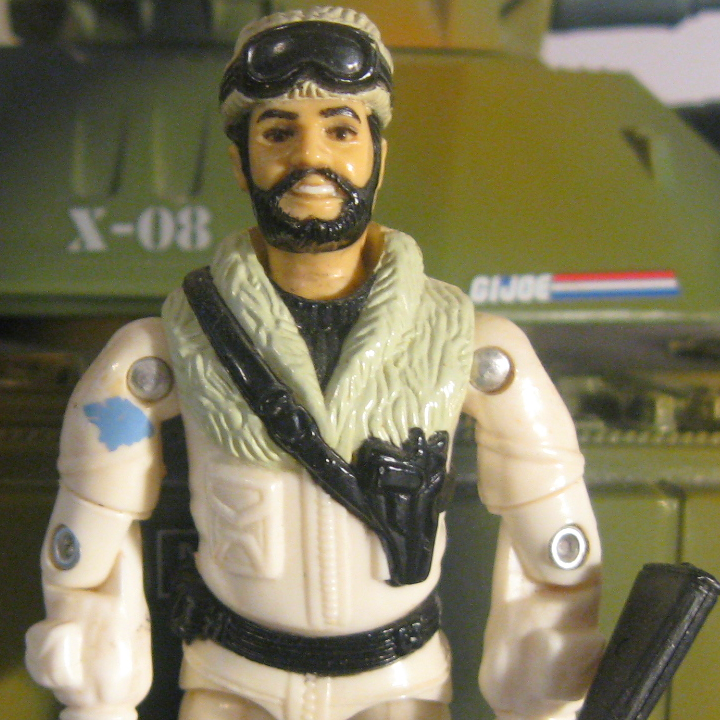 His 1988 outfit was animated for the Tiger Force ad. The Reel FX films used Frostbite's 2004 outfit, with a white visor and grey shoulder pads. Accessories: black oversized M16 rifle with large scope (new). Frostbite was born in a place where summer is a myth and a crowd consists of two people standing on the same acre. He worked briefly as lineman on the pipeline but found the job unchallenging despite the 40 degrees below zero temperatures and hazardous conditions. The army promised to give him a challenge whenever he wanted one. Frostbite graduated from transportation school, Fort Eustis, and armored school, Fort Knox. Qualified expert: M-16, M1911A1 Auto Pistol, M-2 50 cal. MG, and M-60 7.62mm MG.
"Frostbite has to be cool. The environment he works in is too unforgiving. If his Snow Cat throws a piston, he's got to step out into weather that'll freeze a hex-wrench to bare skin in five seconds and carry through a repair job that would be taxing under ideal conditions. He can't afford to panic. Not if he wants to stay alive." Reissues: Reissued in mail offers 1987-1988 and 1992 (Chilling Events, Operation Blackout, End of Slaughter, Top Secret, and Mission Rescue: Code Blue). Accessories: black rifle (85 Frostbite's). FROSTBITE was born in a place where summer is a myth and a crowd consisted of two people standing on the same acre. He worked briefly as lineman on the pipeline, but found the job unchallenging despite the 40 degrees below zero temperature and hazardous conditions. The Army promised to give him a challenge whenever he wanted one. After he took his oath to Uncle Sam, he went to Transportation School where he learned how to drive every known vehicle used by the United States Armed Forces. 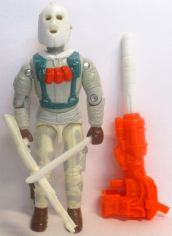 Frostbite thought he had it made being stationed in Greenland, but then he was tapped for duty on Tiger Force and all that changed! Now he's barrelling over sand dunes in the Sahara Desert rather than smashing through snow banks in the Arctic Circle! "Battling Cobra Toxo-Vipers in temperatures over 113 degrees is like fighting them in a furnace, but somehow that 'frost-jockey' from the north keeps his cool! I saw him pulverize a full-scale attack by a battalion of enemy troops just by firing his Tiger Cat's main gun batteries at the center of their ranks! With guys like him over there, we have nothing to worry about!" Accessories: white submachine gun (91 Tracker's), white machine gun (91 Grunt's), white shotgun (88 Muskrat's), orange-red spring launcher with orange-red trigger (93 Duke's), two white spring missiles (93 Bazooka's), white machete (88 Muskrat's), white face mask with holes for eyes and mouth (new), bright white figure stand (common). FROSTBITE grew up in a small, remote town where the only season he ever knew was winter. On his 18th birthday he left home in search of adventure, a search that eventually led him to join the G.I. Joe team. Having driven everything back home from turbo-charged snowmobiles to Alaskan oil trucks, he enrolled in the U.S. Army's Transportation School before being recruited by the Joes. He was a the top of his class and the fastest driver the school had ever seen. He has served in burning hot places like the Sahara Desert, but prefers duty in the frozen North. Vehicle specialties include the Mudbuster and Monster Blaster A.P.C. Motto: "The colder the climate, the hotter my trigger finger!" Accessories: black submachine gun and stock (91 Dusty's), black rifle (90 Ambush's), white backpack (83 Snow Job's), white pair of skis (83 Snow Job's), black pair of ski poles (83 Snow Job's). FROSTBITE was born in a place where summer is a myth and a crowd consists of two people standing on the same acre. He worked as a lineman on the pipeline but found the job unchallenging despite hazardous conditions and 40 degrees below zero temperatures. He joined the army with the promise of endless challenges. He's an expert in all forms of transportation and can make his way through a blizzard of snow and missiles with a steely eye and a big grin. When the NEO-VIPERS ruined unspoiled tundra by turning it into a bio-weapons compound, FROSTBITE made it his personal duty to put them in the deep freeze, permanently. "The cold north teaches you to always keep your cool, whether you're facing a wall of ice or a wall of NEO-VIPERS." Toy Notes: Carded in a two-pack with Neo-Viper. Item #53134. FROSTBITE was born in a place where summer is a myth and a crowd consists of two people standing on the same acre. He worked as a lineman on the pipeline but found the job unchallenging despite hazardous conditions and 40� below zero temperatures. He joined the army with the promise of endless challenges. He's an expert in all forms of transportation and can make his way through a blizzard of snow and missiles with a steely eye and a big grin. 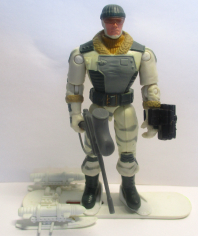 When COBRA forces ruined unspoiled tundra by turning it into a bio-weapons compound, FROSTBITE made it his personal duty to put them in the deep freeze, permanently. "The cold north teaches you to always keep your cool, whether you're facing a wall of ice or a wall of COBRA troops." Toy Notes: Boxed with a Toys 'R Us-exclusive recolor of the Snow Cat. Item #53241. FROSTBITE was born in a place where summer is a myth and a crowd consists of two people standing on the same acre. He worked as a lineman on the pipeline but found the job unchallenging despite hazardous conditions and 40� below zero temperatures. He joined the army with the promise of endless challenges. He's an expert in all forms of transportation and can make his way through a blizzard of snow and missiles with a steely eye and a big grin. FROSTBITE likes to get new toys to play with, and the FOREST FOX vehicle is no exception. It is fast and nimble, with firepower to match. In the SPY TROOPS mode it changes into a transport vehicle with a dual projectile gunner station, which suits FROSTBITE just fine. "Melting the polar ice caps, satellite hijacking - I've seen all the crazy schemes COBRA tries to pull here in the Arctic. But nothing's crazier than the sight of a SNOW SERPENT eating snow cones at -30� C. Those guys are nuts!" "The cold north teaches you to always keep your cool, whether you're facing a wall of ice or a wall of COBRA infantry." Accessories: grey rifle (03 Tunnel Rat's), grey paintball marker with feeder on top (new), two white ski-mounted missiles for snowboard (new), black communications gauntlet (04 Duke's), white snowboard with sliding foot pads, Joe logo on bottom (new). FROSTBITE loves the challenge of surviving and thriving in a harsh arctic environment. There are other G.I. JOE Team members who are better armored vehicle drivers, but few of them could find their way through a blizzard without a GPS, unclog a fuel line in sub-zero temperature, or know instinctively where a crevasse is hidden under snow cover. He doesn't mind the cold; in fact, an icy wind in his face makes him feel more alive. Extreme cold tends to make troops sluggish and careless, but what it does for FROSTBITE is exactly the opposite. Any COBRA infiltration team expecting to attack a G.I. JOE base under cover of a blinding snowstorm is in for a nasty surprise, and his name is FROSTBITE. "Give me black coffee, scalding hot, thick enough to stand a spoon in, then get out of my way." Variations: The single-carded release has a busier camo pattern on the legs. Toy Notes: Carded in a two-pack with Snow Wolf. Item #00278. Reissues: Carded without accessories in the July 2008 Wave 4 discount figure single-pack assortment (Item #34894). Accessories: black rifle (04 Cobra Trooper's), black rifle (03 Cross Hair's), black pair of ice shoes (88 Blizzard's), black backpack (92 Gung-Ho's), black pair of skis (88 Blizzard's). FROSTBITE loves the challenge of surviving and thriving in a harsh arctic environment, there ar eother G.I. JOE Team members who are better armored vehicle drivers, but few of them could find their way through a blizzard without a GPS, unclog a fuel line in sub-zero temperature, or know instinctively where a crevasse is hidden under snow cover. He doesn't mind the cold; in fact, an icy wind in his face makes him feel more alive. Extreme cold tends to make troops sluggish and careless. But what it does for FROSTBITE is exactly the opposite. Any COBRA infiltration team expecting to attack a G.I. JOE base under cover of a blinding snowstorm is in for a nasty surprise, and his name is FROSTBITE. Toy Notes: Carded in a Toys 'R Us-exclusive set with Sgt. Stalker, Backblast, Snake Eyes, Mirage, and Short-Fuze. Item #07253. Toy Notes: Boxed with a recolor of the Ice Sabre. Item #56690.